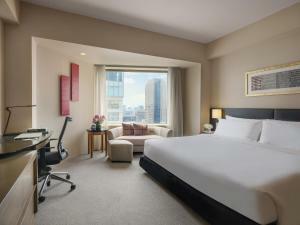 ANA InterContinental Tokyo is located in Tokyo’s Ark Hills, a minute’s walk from Tameike-sanno and Roppongi-itchome Subway Stations. The hotel houses 844 guest rooms, 12 dining options and 22 event halls. The hotel’s 20-metre outdoor pool is open during the summer months. Guests can lounge on the deck chairs at the poolside or get a workout at Ka-Tsu, the 24-hour fitness centre on site. Please contact the property in advance if you are traveling with multiple children. Rooms have a maximum capacity of 3 persons (including children) per room. For more information, please contact the property directly. An accommodation tax per person per night is not included in the price and needs to be paid at the property. For guests staying in Osaka, this tax will only apply to stays which begin on and after 1 January 2017. Elegantly decorated room with modern furnishings and soft lighting, located on floors 7 to 20. Amenities include a flat-screen cable/satellite TV, minibar and personal safe. An extra bed will be prepared for a 3rd guest, only when the booking is made for 3 guests. Please indicate the correct number of guests at time of booking. Rate: ¥ 34000.00 ... ¥ 85500.00; select dates below to get current rates. Spacious room equipped with a flat-screen cable/satellite TV, minibar and personal safe. They are non-smoking, and elegantly decorated with modern furnishings and soft lighting. An extra bed will be prepared for a 3rd guest, only when the booking is made for 3 guests. Please indicate the correct number of guests at time of booking. Free internet and fitness centre access. Room is equipped with 37" LCD TV. 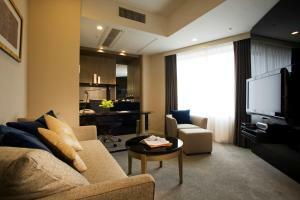 Elegantly decorated, with modern furnishings, soft lighting, minibar and personal safe. An extra bed will be prepared for a 3rd guest, only when the booking is made for 3 guests. Please indicate the correct number of guests at time of booking. Elegantly decorated room with modern furnishings and soft lighting, located on floors 7 to 20. Amenities include a flat-screen cable/satellite TV, minibar and personal safe. Bed type and smoking preference will only be assigned on arrival and is subject to availability. Twin rooms feature 110cm wide beds. An extra bed will be prepared for a 3rd guest, only when the booking is made for 3 guests. Please indicate the correct number of guests at time of booking. Rate: ¥ 32300.00 ... ¥ 83000.00; select dates below to get current rates. This room is located on the 28th-31st floor. Decorated with luxury furnishings that are inspired by Japanese motifs, this room feature an espresso machine, free WiFi and fitness centre access. 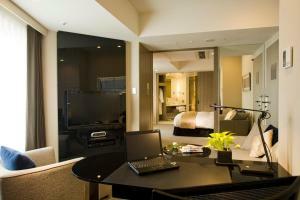 Room is equipped with 37" LCD TV, a fridge and a minibar. The en suite bathroom comes with a bathtub and a TV. 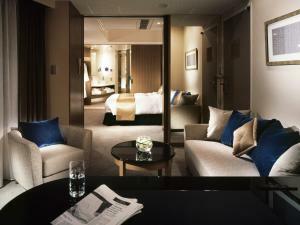 The hotel will allocate a bed type to the guest on arrival; they are subject to availability and cannot be guaranteed. Non-smoking and smoking preferences can be requested. Rooms come with free Wi-Fi and fitness centre access, as well as a 37" LCD TV. An extra bed will be prepared for a 3rd guest, only when the booking is made for 3 guests. Please indicate the correct number of guests at time of booking. Decorated with luxury furnishings that are inspired by Japanese motifs, this room features an espresso machine, free WiFi and Club InterContinental Lounge access. Room is equipped with 37" LCD TV, a fridge and a minibar. The en suite bathroom comes with a bathtub and a TV. The property will allocate a room type to the guest on arrival; bedding and smoking preference are subject to availability. This single room has air conditioning, cable TV and minibar. This suite features a minibar, flat-screen TV and air conditioning. An extra bed will be prepared for a 3rd guest, only when the booking is made for 3 guests. Please indicate the correct number of guests at time of booking.